This training is appropriate for those who have some or much experience in spirometry as well as those who have never used a spirometer as individualised attention is given and learning occurs at the pace of the person being taught. Any person who needs the time and knowledge of a professional qualified and experienced instructor but does not have the time to undergo the Certificate in Spirometry Training, or those that want an hour or two to top up their knowledge base should apply. The Spirometry one on one training carried out in the workplace aims to equip the learner with all the background knowledge and skills necessary to prepare for a spirometry test, how to carry out a test as well as how to handle pitfalls in the testing process and assess the quality of the data collected and interpret results. Guidelines are given on setting up and running a spirometry service. New spirometers can be set up and individualised. All practical training can occur on the learner’s own spirometer or a spirometer and disposables can be supplied at no extra cost. The presentation of the training will be formal i.e. power point overheads, and a comprehensive manual but informal in that the training will go in whatever direction most suited to the individual learner, whilst knowing that all necessary information will be covered. Theoretical and Practical aspects will both be covered and comprehensive practical sessions carried out all dependent on each individual’s needs. As the course content is individualised for each learner so the training material supplied will depend on the amount of time taken for training. 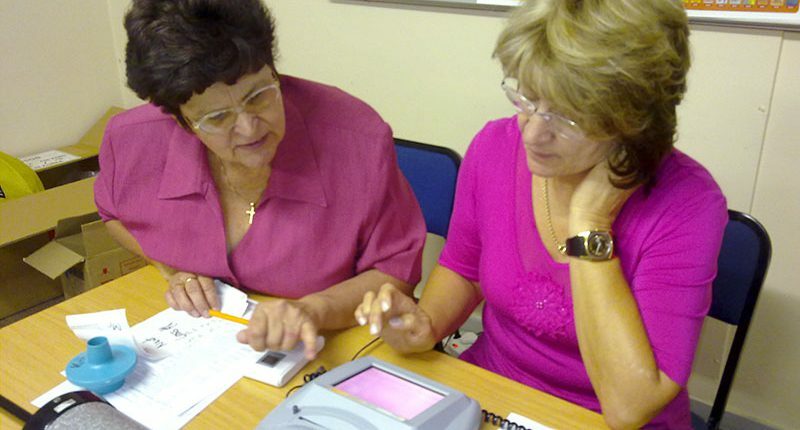 An up-to-date spirometry manual using current international and South African guidelines is provided or copies of slides to be used with everything the learner needs to know for both the written and practical aspects of spirometry as well as to refer back to when continuing with spirometry in the workplace. A spirometer and all disposables are available for use during practical time if the learner does not have one of their own. wherever possible your own spirometer together with disposables and the manual that goes with the machine. Calibration Syringe and Weather Meter. Print out any spirometry tracings that are of interest or you would like to discuss. One on one training can be arranged at any location nationally within South Africa or in other African countries on dates suitable for learners and the facilitator. Training includes a Comprehensive Manual and/or copies of slides, worksheets, a spirometer and disposables and a Certificate of Attendance. The hourly rate excludes any travel, accommodation or car hire costs that may be necessary for the facilitator. These cost apply over and above the hourly rate. Fees must be received 14 days prior to training. Since expenses are fixed, refunds cannot be given unless written cancellation is received two weeks prior to the course. The fee is also transferable to any subsequent course within a six months period.